Thanks to the guys over at Bankcroft in Germany, we finally have a picture of the upcoming Elite Mega Magnus blaster! So I'll jump on the bandwagon and post about it, if only for the interesting design. The blaster boasts a 3 dart internal clip, 85 ft. ranges, and top loading. Without a better picture angle, it's hard to judge the exact mechanism at work, but the nested tubing you can see at the back of the bolt suggests that this is also a reverse plunger like the Centurion - considering the size requirements for Elite Mega darts, it's hardly surprising that Hasbro went with a plunger design that can fit in tight spaces. While Nerf fans may dislike reverse plungers, they are extremely efficient it this type of setup - if the dart sits entirely inside the bolt, as with the Nerf Reflex, there is zero dead space. Here's hoping that the Magnus does better than the Centurion; too many have had problems wih that blaster breaking or destroying darts. Vehicles of Mass Destruction - Mobile Nerf Artillery! 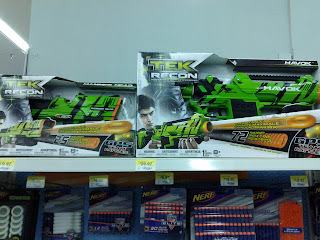 While perusing the non-Nerf aisles at TRU, I looked in the R/C section for any interesting toys. After all, the Air Hogs Battle Tracker provided an interesting (albeit expensive) experience. However, these products really caught my eye, given the claims on the box. To the NSA: this is a VMD, not a WMD! The first, a mobile dart turret, has 16 shots and claims ranges of up to 30ft. These are angled, obviously. 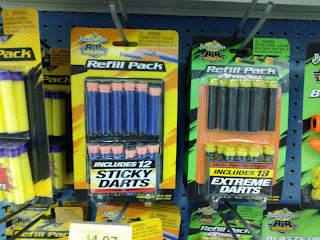 Since there does not appear to be room for a plunger of any kind, I'm assuming the darts are launched with flywheels. The darts also appear to be the same size as any other stock dart. Even more exciting, however, is what appears to be a Spy Gear Signal Launcher on wheels! After close inspection (and a bit of wiggling to put my hand inside the packaging), I found that it is indeed an air blaster. The faux pressure gauge on the back is actually the handle for an air pump. Once I have more disposable income (damn you, old car! ), I'd gladly pick one or both of these up. The listed prices are $59.99 each, which isn't too bad for a new R/C gimmicky product, all things considered. 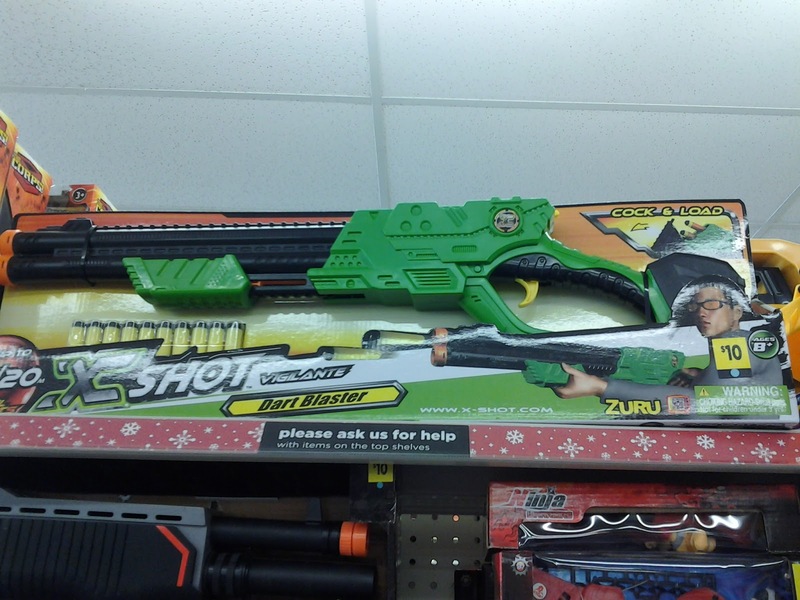 Assuming I'm right about the Missile Striker, I'd love to grab one and modify it into a dart shotgun. 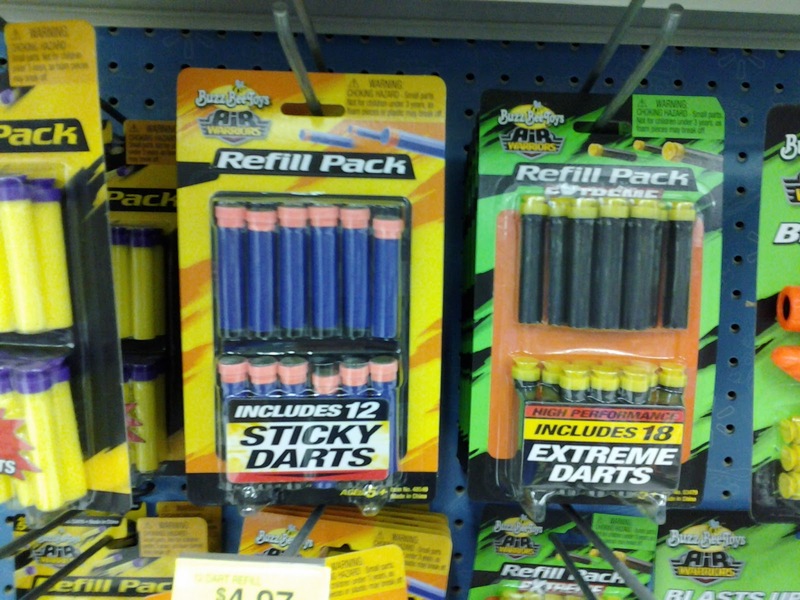 Being able to trigger a large shower of darts from a safe distance? Priceless! After seeing hints of the line's existence online, I finally found some in stock at a Columbus, OH ToysRUs. Sadly, it seems that these are just another company's variation of the previous Supasplat line. The box on the right features the Bow Stryker - almost identical to the Supasplat bow. On the back of the box, the instructions clearly show that the trigger only serves to load the next paintball for firing - otherwise, it's a pull and release blaster. I'm sad to see the lesser paintball markers going this direction - most of us who have used Pistol Splats or similar, trigger-fired blasters can testify to their great performance, especially when used for firing foam darts. I'm guessing these blasters still operate using a bungee within a thin plunger tube. I've reopened the sales section of the blog - look at the list and/or ask if I have something. It is by no means a comprehensive inventory, just what I've counted so far before I went to bed last night. All the rules for doing deals are listed there. As a personal disclaimer, I haven't been active selling blasters for a while - it was only a couple years ago that we found the right treatment for my depression issues, and before that point I had already dropped off the face of the Earth in the middle of some Nerfhaven sales threads. While I eventually refunded everybody, it's by no means a mark you just wash off. Perhaps I can get accepted there again, but that takes lots of time and lots of proof that I'm holding up on my end. If you still feel ok dealing, read the rules (which are stricter on my end than yours) on the Sales/Contract Tab! People who have already commented on buying things, please post in the other thread, etc. Between cleaning and school, life's been busy. Sadly, life took a bad turn this morning on the way to college. Yep, the car is totaled. 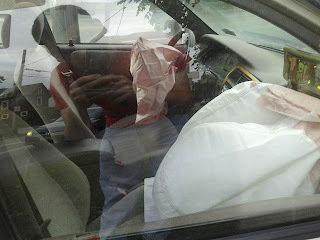 We did have full coverage, so things aren't a total loss, and I'm perfectly fine. However, I will be opening up sales again to unload many of my excess blasters so that I have extra cash for when I have to get a new car. The collection is vast, so just ask and see if I have what you're looking for. I do know I have tons of Air Tech 2k/3k blasters, lots of Hornets and Longshots, NIB Marshmallow Blasters, N-Strike Clear Series, and other things. Just ask in the comments while I attempt to take inventory this afternoon! 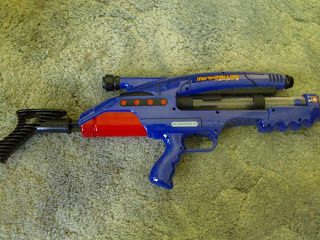 Continuing my reviews of the Marshmallow Fun Co.'s product line, we start with a basic teardown of the Marshmallow Rapidfire Blaster. If anything, there's instant appeal in the shell design. Looks like something out of Mass Effect, doesn't it? Lanard Huntsman Product Line Update - the Scout? While searching for international availability of the Huntsman blasters, I came across this entry for a "Scout" on a French toy site, listed for €6.99. It appears to be functionally similar to a Buzz Bee Jaguar, but with a distinct shell of its own. I actually like the look of it. Aside from spotting the Rebelle Powerbelle on Walmart shelves, I saw other blasters of note in stores. 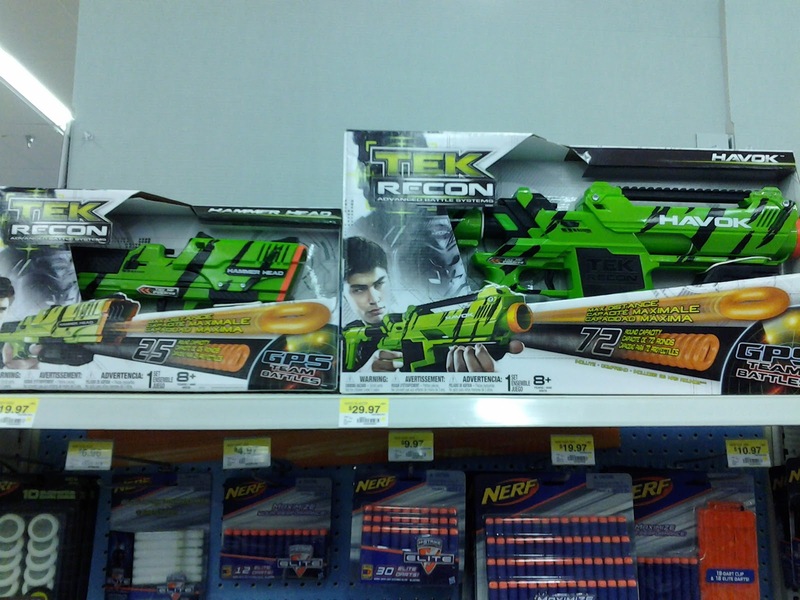 First, Walmart: both Tek Recon blasters were on the shelf, along with NRG round refills. Also on display were the last of the new Buzz Bee darts: sticky darts. Yep, it's a gooey tip, not velcro. 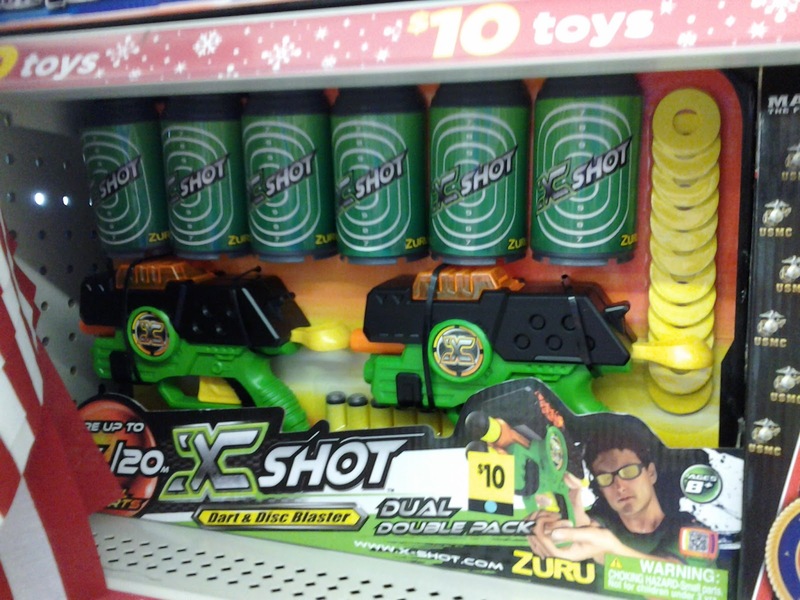 Over at Dollar General, two of the Zuru Xshot blasters are now on shelves: the Vigilante and the Dual Double Pack. They're each roughly $2 cheaper than the Air Zone versions at ToysRUs. 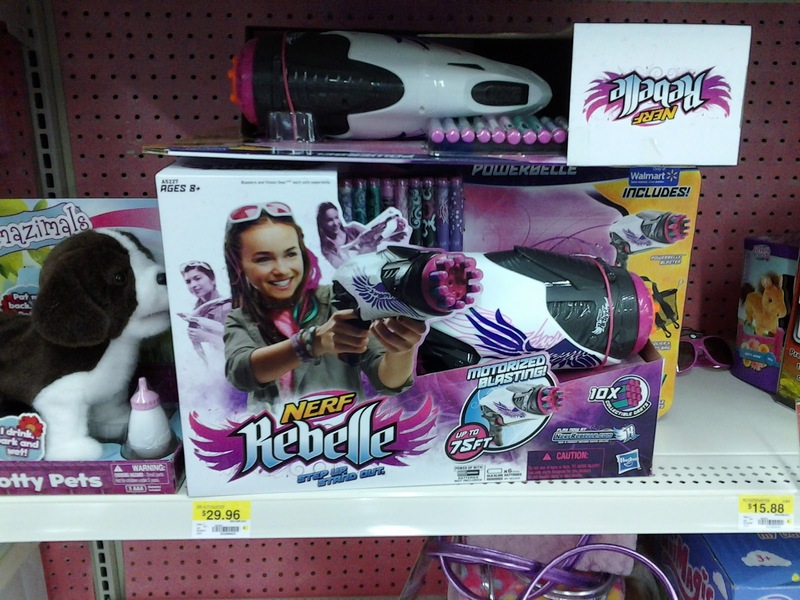 The Powerbelle was spotted weeks ago by observant NIC members on Walmart's website, as a store exclusive. Well, I spotted it in store earlier today, and gladly snatched one up. Want to see more? Follow me! 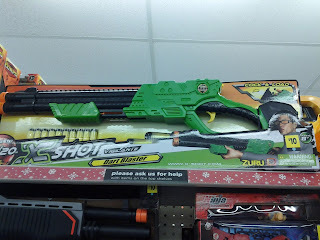 While perusing the interwebs, I came across a series of paintball blasters I had never seen before. Buffdaddy Nerf Projects Kickstarter Coming Soon! Just thought I'd announce this, to help gauge interest. I'm planning on making a series of homemade blaster kits, that people can buy and put together. Make it a learning experience for Nerfers out there who have never experimented with homemades before. Buy a kit, it arrives with all the parts and instructions, and you go from there. After all, most people enjoy the feeling of making their own blaster, don't they? I will be finalizing a prototype(s) this week, and post the Kickstarter afterwards. Nerfers typically refer to their toys as "air blasters" or (less accurately) "air guns" if the dart is being fired by pre-compressed air. In theory, this would include anything from a small firing tank to a giant hopper slapped onto the end of an air compressor hose. Outrageous comparisons aside, air blasters are capable of longer ranges than springers, but are limited in rate of fire. On the homemade front, air blasters are not usually seen at wars due to inherent safety issues from working with compressed air. When they are used, they are highly regulated to ensure the safety of both the operator and the person at the receiving end of said operator's darts. Classes from 8am - 5pm, plus the hour commute each way, tend to intrude on Nerf time. But I'm not forgetting this! So for now, a question: anything you guys would like to see? Mods, homemades, etc? I figure I can open up a discussion while I suffer through the rest of Tuesday. Today's my one day of lab until 9:30pm.